If you love a small dog bursting with personality and drive, the Border Terrier is a perfect choice. These versatile dogs excel at many activities and will keep you on your toes. The Border Terrier is a small dog weighing between 11 and 15 pounds, with females being slightly smaller than males. Border Terrier breeders say these dogs have an 'otter head' or 'otter face' because of their distinct rounded features. They also have longer legs than other terriers of about the same size. They can live up to 12 to 15 years. 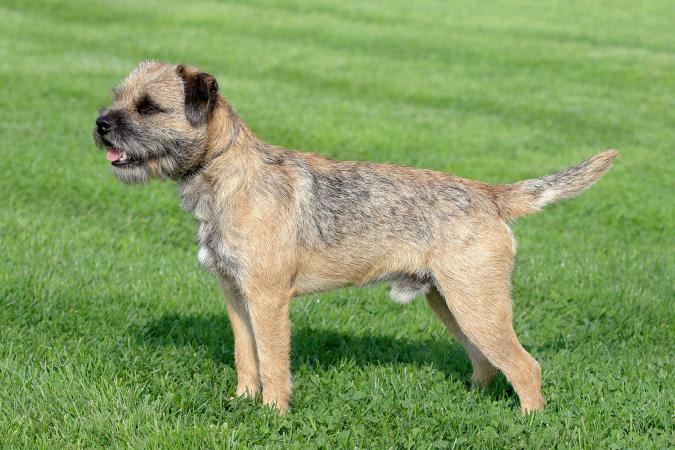 The Border Terrier has a wiry short coat that comes in wheaten, red, or a combination of grizzle and tan, or blue and tan. Border Terriers have a soft undercoat and like most breeds with this type of fur, need a regular stripping at least twice a year to remove dead hair and keep the coat healthy and clean. To maintain a Border Terrier's coat, you just need to spend a few minutes a day brushing him. They also do not need regular bathing. 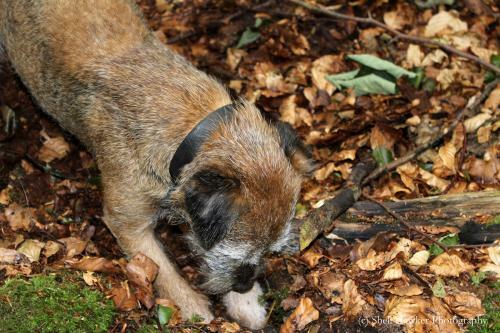 Like all terriers, the Border Terrier can be feisty, independent and very active. They also are intelligent and do well with most types of training and dog activities. They can be a bit mellower and less dog-aggressive than other fellow terriers as they were bred to cooperate with foxhounds during hunts and to hunt farm pests like rodents and foxes, and this heritage gives them a strong prey drive as well as the urge to dig. If you have a beautiful garden, you will want to be prepared to channel their love of digging elsewhere. 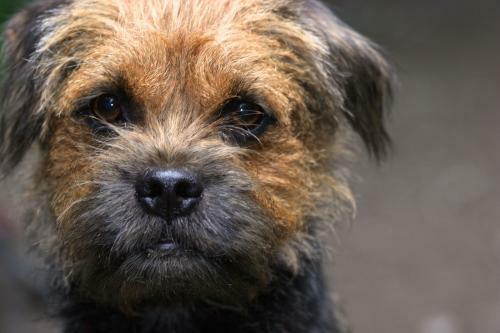 Border Terriers are friendly, good-natured dogs who do well with most types of people, young and old. Border Terriers are active dogs who need regular exercise to stay healthy but these dogs do not need a house and a yard. They can be good apartment dogs provided they get their daily walks and play time. Because they have a high prey drive, walkers should be aware their Border Terrier will chase small animals. Consequently, you should train your Border Terrier to stay focused during his walks. It's also important to provide them with mental enrichment as they will become bored easily and engage in destructive behaviors to fill the time. They can also bark a lot if left alone for too long with no physical or mental outlets. Like puppies of any breed, early socialization is important for Border Terrier puppies. The sooner they have positive interactions at a young age with other animals, the more likely they will be able to live harmoniously with other dogs and cats. Border Terriers are easy to train due to their intelligence but you will want to make sure you train them to have a solid recall (coming when called) and attention to you in case they get off leash and chase after something small and furry. 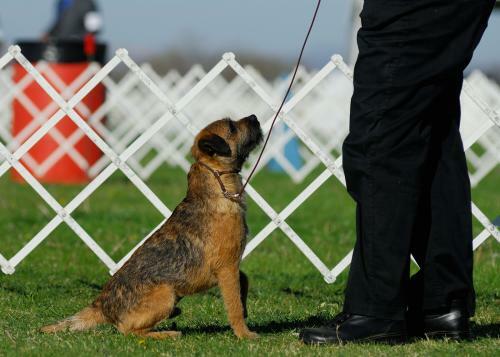 Border Terriers excel at many dog sports, including dog agility, competitive obedience, Rally, Earthdog, and Barn Hunt. They're very common at agility competitions whereas you're less likely to see other terrier breeds present. Canine hip dysplasia is a painful condition that can lead to lameness and loss of use of the dog's hind legs. Canine epileptoid cramping syndrome (CECS), also known as Spike's Disease, is a type of seizure disorder. Colitis involves an inflammation of the colon and intestines causing diarrhea. Heart defects including Pulmonic Stenosis which can be mild to serious leading to heart failure. Hypothyroidism which can lead to weight gain, lethargy, and skin and hair problems. Luxating Patella is a dislocation of the kneecap that occurs in many small dogs. Prognathism, or underbite, is a problem where the dog's lower jaw juts out past the upper jaw. 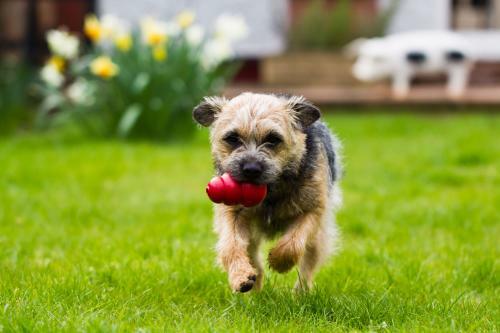 Is the Border Terrier the Right Dog for You? The Border Terrier is an energetic, hardy dog that enjoys people and makes a wonderful family pet. He does best in a home that can provide for his physical and mental needs. However, he's a calmer dog compared to many other terriers.